If you are a regular reader, than you know how much I LOVE Beverly Lewis’s books. She writes mostly Christian Amish Fiction and her stories are so inspiring and wonderful books to read. I was sent a free copy of her latest book, The Secret Keeper, to read and review. I was SO excited to see this in my mailbox, I collect all of her books and had just recently finished reading the 3rd installment of this series, Home to Hickory Hollow. The first three of the series are: The Fiddler, The Bridesmaid, and The Guardian. This 4th installment didn’t disappoint! Don’t forget to check out Beverly Lewis’s website and you can find a copy of this book HERE! Disclaimer: I was given a free copy of this book to review, I was not compensated for this review nor are my opinions of this book influenced by the author or company who loaned me this book for a review. This review in it’s entirety is my opinion, and in my own words, honest and true! Being a stay at home mom means that I have a LOT of laundry. ALL. THE. TIME. It’s ridiculous really, and not only that, but since we cloth diaper I have that added amount of laundry every other day! Something I’m not good at is figuring out the best way to get out stains… but I found a solution! You just choose what type of stain it is, a specific stain, and then what material it’s on and then…. You get a stain guide! I NEEDED this! I’m seriously horrible at trying to figure this stuff out, so this is PERFECT! You just choose the fabric you are dealing with and it tells you the best way to wash and dry it! It’s pretty phenomenal if you ask me! This is the laundry timer – you can use this if you want your clothes in the dryer for a specific amount of time… or I guess you could use it for just about anything! Here is a label decoder for those complicated symbols you see on the tags of your clothing. 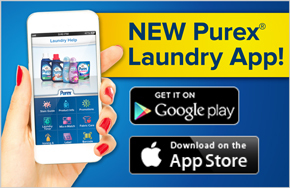 This is a product info tab – you can choose which type of product you want information about and it will show you the different products that Purex sells and info about each of those products. We don’t use anything but Charlie’s Soap and Oxiclean since we cloth diaper right now, but I can imagine this will be useful once we are done having babies and washing diapers. 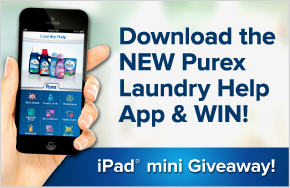 There’s a promotion option that shows you all the neat promotions that Purex is offering at the moment. This resource is pretty neat too! It allows you to choose whether you need to iron or fold, you then choose what you need to iron or fold, and it gives you a step by step tutorial on what you need to do! I may need that… I’m awful at ironing… and folding… and well laundry in general! And last, here’s a fun little matching game you can play if you ever have to do your laundry at the laundry mat! Like I said, this app is absolutely FREE, no catch! There is even a sweepstakes going on to win an iPad mini! Just click on the picture below to enter! Click here for the iOs App! Or HERE for the Android App! 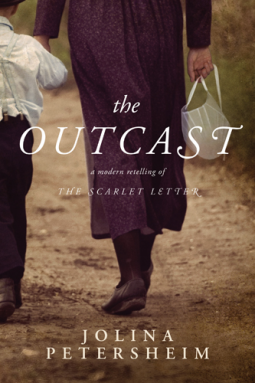 I just finished this book, The Outcast, last night on my Nook. Like my last book review on Pennsylvania Patwork, this book is about a similar community of people called Old Order Mennonites. The main character is Rachel, a young woman who has mothered a son out of wedlock, which is unheard of in a community such as hers. No one knows who the father is except her (and the father of course) and she is ridiculed and asked to leave the home of her twin and her twin’s husband where she had been staying to help care for her sister and newborn nephew. She moves in with an eccentric woman who runs an “Amish” Country store and throughout the book the story of her life and the father of her son come to light. She faces many tribulations, including her son, at the young age of 6 months old, facing cancer. This too was a wonderful read, the story was complex and full of interesting coincidences and loopholes. This “modern” version of The Scarlet Letter is a must read, it’s a phenomenal tale of redemption and hope. Amazon has copies in paperback, for the Kindle and in audio form, as does Barnes & Noble for the Nook, in paperback and in audio. Don’t forget to check out Jolina Petersheim’s website HERE! Disclaimer: I was loaned a free copy of this e-book to review, I was not compensated for this review nor are my opinions of this book influenced by the author or company who loaned me the e-book for review. This review in it’s entirety are my opinion, my words, honest and true! Some of my favorite books to read are Christian Fiction about Amish families, perhaps it’s the simplicity of their lifestyle, their steadfast faith, or just the fact that the stories the authors tell are so interesting… but I just LOVE them! I was given the opportunity to read and review a book called Pennsylvania Patchwork by Kate Lloyd, this particular novel is about a woman named Holly who is living with her mother and grandmother in Amish country. Holly was raised as an Englischer, never knowing that she was from an Amish background and after having moved back to her grandmother’s house with her mother, who has decided to rejoin the faith, finds her heart in a tug of war of love. Three men want to be her husband, but which one will ultimately win her heart? An Englischer from her hometown of Seattle? A man of Amish background? Or the Mennonite veterinarian? I highly recommend this novel, it was a wonderful and uplifting read! You can find it at most book retailers, Amazon has copies available for Kindle and in paperback, Barnes and Noble has it for Nook and in paperback, and you can find it at most Christian retail stores as well! And don’t forget to check out Kate Lloyd’s website HERE. Happy reading! Anyways, this was just a brief blog post between school assignments to let you know to keep an eye out for these reviews!